The mammalian brain is the most complex system in all of biology. The human brain has ~100 billion neurons and perhaps 500 trillion synapses, contact sites between neurons through which information flows. The differentiation of a vast array of distinct neuronal cell types from stem cell progenitors, and their migration to form layers and clusters, is a key developmental step that can be disrupted in human disorders such as microcephaly and lissencephaly. The elaboration of dendrites and axons and their formation of specific neural circuits underlies all mature function, and dysregulation of these processes underlies a wide variety of genetic and syndromic disorders, including forms of autism spectrum disorders, Down and Fragile X Syndromes, and schizophrenia. My laboratory is focused on identifying the fundamental molecular mechanisms that control neuronal differentiation and neural circuit formation during brain development. We take a candidate approach, generating allelic series of transgenic and knockout mice and analyzing their developmental phenotypes with a wide range of genetic, biochemical, pharmacological, molecular biology, and cell biology techniques. We focus on genes and processes that have been implicated in human neurodevelopmental disorders. Multiple projects are available for ambitious graduate students, postdocs, and undergraduate Honors students. Our work has been continuously funded since the lab’s founding in 2004, including grants from the National Institutes of Health, the March of Dimes, the Carver Trust, the Nellie Ball Trust, the Mallinckrodt Foundation, the E. Matilda Ziegler Foundation for the Blind, and the National Multiple Sclerosis Society. Three large clusters of cadherin-related genes (Protocadherin-α, -β, and -γ) lie in a tandem array on a single chromosome in mammals. The γ cluster, on which we focus, consists of 22 "variable" exons, each of which encodes the extracellular, transmembrane, and partial cytoplasmic domains of a single protocadherin (Pcdh) isoform. Each variable exon is spliced to a set of three "constant" exons which encode a shared C-terminal domain. Thus, a variety of adhesive specificities can link into a common signaling pathway (Figure 1). 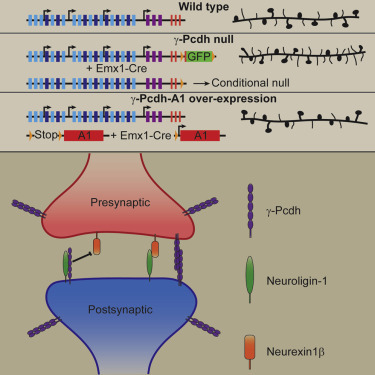 Because each neuron expresses ~6 of the isoforms in a semi-stochastic manner, the γ-Pcdhs may provide a “molecular code” that helps specify cell-cell interactions. We have shown that the γ-Pcdhs act as homophilic adhesion molecules and have identified them as critical mediators of proper dendrite arborization and synaptogenesis in the cerebral cortex. 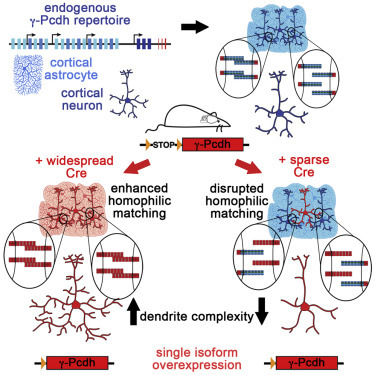 Homophilic trans-interactions between specific γ-Pcdh isoforms on neurons and astrocytes regulates the extent of dendrite outgrowth in vivo (Figure 2). Additionally, cis-interactions between the γ-Pcdhs and the autism-associated protein neuroligin-1 regulate the formation of dendritic spines and excitatory synapses in the cortex (Figure 3). Importantly, epigenetic regulation of γ-Pcdh repertoire is disrupted in neurodevelopmental disorders such as Down syndrome, indicating that the mechanisms we’ve discovered have implications for both normal and disrupted human development. In new work, we’ve used CRISPR/Cas9 genome editing to generate a new series of mice in which γ-Pcdh diversity is reduced. We will use these mice to test hypotheses about the role of molecular specificity in cell-cell interactions in vivo, and to define human disease-relevant behavioral deficits that result from altered γ-Pcdh expression. A key step in the development of the brain is the transition from proliferating neural progenitors to postmitotic neurons. These neurons then migrate to their final cellular position to differentiate and elaborate dendrites and axons to form circuits. The molecular mechanisms regulating neuronal differentiation are only partially understood; recent work indicates that chromatin remodeling machinery, which regulates the expression of thousands of genes by altering DNA structure, plays an important role. Akirin2 is a nuclear protein that is known to interact with subunits of the BAF chromatin remodeling complex, but whose function in mammalian cells has been obscure. We found that the Akirin2 gene is expressed in cortical progenitors and in postmitotic cortical neurons, and generated cortex-restricted knockout mice using the Cre/LoxP system to analyze the function of Akirin2. Remarkably, when Akirin2 is absent from cortical progenitors, they completely fail to generate the cerebral cortex, and exhibit an extreme form of microcephaly. Most knockout mice die at birth with little-to-no cortical tissue present; a few survive postnatally, despite lacking a cortex (Figure 4). Analyzing control and knockout transcriptomes using RNA sequencing suggests that Akirin2 is critical for activating genes maintaining progenitor fate, and for repressing the genes associated with neuronal differentiation. Using distinct Cre transgenic lines to limit Akirin2 mutation to astrocytes, we have also found severe defects in the cerebellum indicative of defective neuronal migration and differentiation. These data identify Akirin2 as a novel master regulator of gene expression patterns required for proper neuronal and glial cell fates. Figure 1: The mouse clustered Protocadherin (Pcdh) gene loci. An example transcription and splicing pattern for the Pcdhg cluster is shown, as well as a schematic of γ-protocadherin protein structure (from Peek*, Mah*, and Weiner, Cell and Molecular Life Sciences, 2017 [Review article]). Figure 2: Homophilic γ-Pcdh interactions drive dendrite complexity. We manipulated the expression of γ-Pcdh isoforms in the mouse cerebral cortex to demonstrate that the complexity of a neuron’s dendritic arbor is promoted by local homophilic interactions with other neurons and with astrocytes (from Molumby*, Keeler*, and Weiner, Cell Reports, 2016). Figure 3: The γ-Pcdhs regulate dendritic spine and synapse development through inhibition of neuroligin-1. The γ-protocadherins negatively regulate cortical dendritic spine morphogenesis in vivo. They can interact physically with neuroligin-1 and inhibit its ability to bind neurexin1β, to promote presynaptic differentiation, and to increase dendritic spine density in hippocampal neurons in vitro (from Molumby et al., Cell Reports, 2017). Figure 4: Akirin2 is required for the cortex to form. A) Schematic and td-Tomato Cre reporter showing Emx1-Cre activity, limited to the cerebral cortex. B) In situ hybridization confirming expression of Akirin2 in cortical progenitors, and the loss of Akirin2 transcripts in the Emx-KO (cortically-restricted knockout) mice. 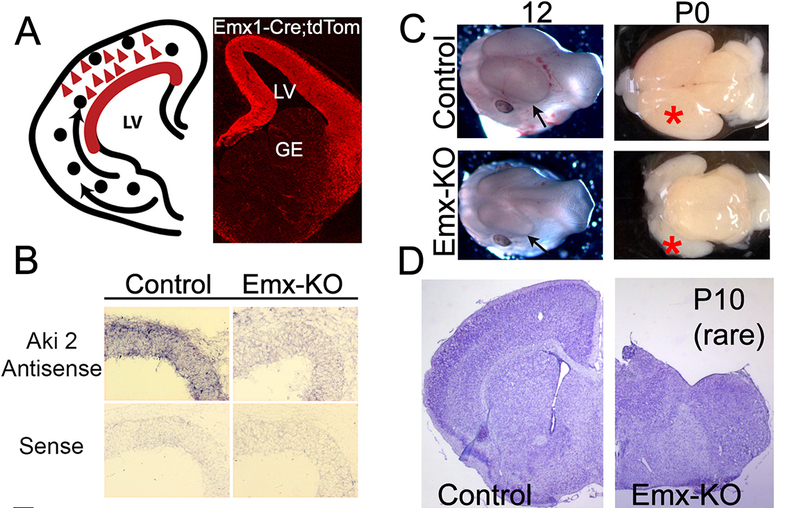 C,D) Cortex (arrow,asterisk) is already reduced in size at embryonic day 12, and is essentially absent at P0, when most of the Akirin2 Emx-KO mice die. In rare surviving postnatal knockout mice, essentially no cerebral cortex is visible (from Bosch et al., Neural Development, 2016). This page was last updated on Thursday, January 25, 2018 - 11:18am. Please contact us at biology@uiowa.edu or 319-335-1050 if you need further information.